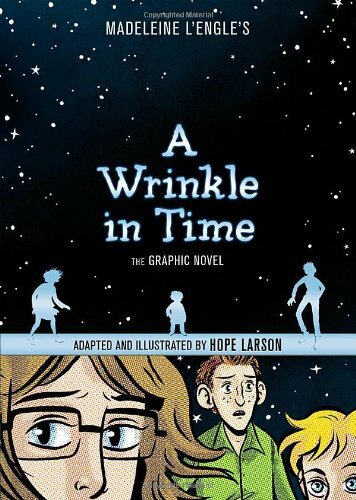 Book Review: A WRINKLE IN TIME - THE GRAPHIC NOVEL By Hope Larson | Birth.Movies.Death. Disclaimers: I know Hope Larson. A complimentary copy of this book was provided by the publisher. Fifty years after Madeleine L'Engle published her beloved science fiction classic about a peculiar young girl, her family, the boy she likes and space/time travel, Mercury and Chiggers author Hope Larson adapted the book into a graphic novel, a vivid imagining of those words many of us have cherished since childhood. The book is elegantly, earnestly drawn, a rare fit of artist and material. 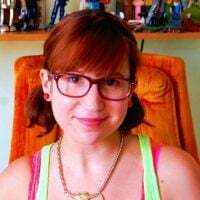 Larson's previous graphic novels are original stories of young women struggling with accepting themselves through the hazards of adolescence, and few YA characters struggle so much as the eternally awkward Meg Murry. Meg is a marvelous amalgam of contradictions, a messy character to whom generations of young women have related for the past half a century. She is vulnerable yet stubborn, brilliant but terrible in school, often terrified and always brave. Meg is the heart of A Wrinkle in Time, and Larson nails this most important characterization, a girl who is all limbs and tantrums and braces and dreamboat eyes. The other human characters are as poignantly represented, from darling little Charles Wallace to the affable Calvin, Meg's brilliant mother and father and her unjustly normal twin brothers. But the most remarkable part of A Wrinkle in Time: The Graphic Novel is the way Larson allows us to see the unseeable, illustrating impossibly esoteric concepts such as the tesseract, IT, The Black Thing, the disquieting symmetry and rhythm of Camazotz. Those dear, revered old ladies, Mrs. Whatsit, Mrs. Who and Mrs. Which, are cozily conceived, kind and wise. Aunt Beast is soft, flowing, maternal warmth made corporeal. I want to dive right into the page and into her furry embrace. A Wrinkle in Time is a book of ideas, of singular intangibles, and the graphic novel never loses that magic by turning those ideas into something substantial. The scene where Meg, Calvin and Charles Wallace ride Mrs. Whatsit's centaur form and gaze on Uriel's moon is as enchanting and mythical as it ever was in my childhood imagination. Larson manages a difficult task, imbuing a beloved story with her own signature without imposing on L'Engle's original material. Each page is stylish, imaginative, absolutely beautiful and, most impressively, fresh. The graphic novel renders the heart of what we love about A Wrinkle in Time, takes the lessons L'Engle taught - we can't always rely on our parents, our flaws can be our strengths, we should be proud to be different, "you don't have to understand things for them to be," - and makes it all feel wonderfully current and new. A Wrinkle in Time: The Graphic Novel doesn't come out until October, but you can read the first chapter of the book on Larson's website. Stay tuned for my interview with Larson in the next day or two!